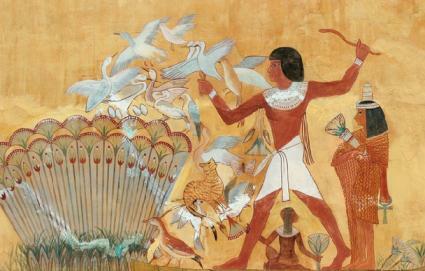 Ancient Egyptian board games were played by all classes of people. Some games were only available to the wealthy, but there were a number of games created for the poorer classes. Many types of board games have been discovered by archeologists, but finding the rules of the games have been harder to find. Determining how to play the board games has taken a little guess work dependant on where the games were discovered and what condition they were discovered in. Senet, an ancient Egyptian board game for two players, is played on a 30 square board with 3 rows of 10 squares each. At the beginning of the game, alternating colored markers are placed on the squares in the first row. The object of the game is to move your pieces off the board by moving them in a zigzag pattern to the 30th square. Egyptians used four flat sticks that were dark on one side and light on the other. Depending on how the sticks landed, you could "roll" a 1, 2, 3, 4, or 6. If you roll a 1, 4, or 6, you get another turn. Your goal is to move all your pieces off the board. You can't land on your own pieces. You can land on an opponent's pieces and switch it with your previous position if he isn't on a safe square, if he doesn't have more than 2 pieces in the same row, or if his pieces are "paired" or next to each other. There are safe squares in which you can't swap out pieces and there are danger squares which place you back on a previous row. Mehan was a popular game for the lower classes because the game board could be drawn or carved into any surface, including a dirt floor. Wealthier Egyptians had game tables made on a pedestal, resembling a mushroom. A snake is coiled around the board and players start at the tail. The body of the snake is split into squares; a typical snake had about 60 squares to push through. The object is to be the first to move your piece from the tail to the snake's head. Up to six players used lions and lionesses and ball pieces to maneuver around the board. Seega is an ancient Egyptian board game similar to checkers and Go where you attempt to capture your opponent's pieces. Some Egyptologists have even likened Seega to Risk. Gameplay is on a 5 x 5 board. 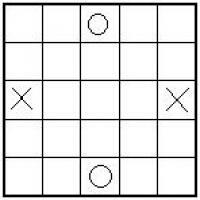 To start, players place two pieces on the board, one player on the X's and other on the O's (see picture). Then, each player alternatively places the rest of their 10 pieces on the board while leaving the center square empty. You capture a piece when you move your piece and 'sandwich' an opponent's piece. Pieces can only be moved into empty, non-diagonal, and adjacent squares. You can move pieces into a space that is sandwiched by your opponent. This makes your piece safe. If a player can't make a move at all, then that player can remove one of the opponent's pieces to make room for a move. One last rule is that if, after making a move and capturing a piece, that same piece can move again and capture another piece, then that player can continue to move that piece. It is possible to have two, three, and four move combos. Aseb is played on a 20 square board where there are 3 rows of 4 squares and then the middle row protrudes out 8 more squares. Players start on the shorter rows and attempt to move their pieces off the board, by moving down the long row until they reach the last square. Four of the squares include extra turns. To start, a player must throw a 4 or a 6 to move their pieces from their reserves, then throw again to move it. If a player lands on a square with an opponent's piece, the opponent's piece is moved back into the reserves. This ancient Egyptian board game is sometimes mistaken for the Royal Game of Ur and Tjau, the Game of Thieves. If you are looking for new board games to play, try out some of the classic Egyptian games for a fun ancient Egypt activity. They don't require fancy equipment or have in-depth rules; you can pretty much get started in a matter of minutes. Boards can be drawn on paper or etched into wood and pieces can be as simple as checkers you already have or rocks sitting outside your door. Playing those old games can give you an idea of what people did to pass the time and may just pass your time with much enjoyment.